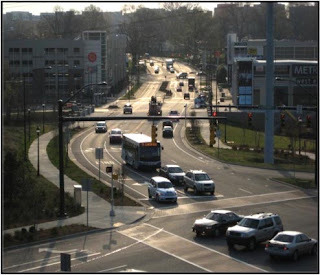 ﻿﻿Complete streets, sometimes called multi-modal streets, are designed to be safe and comfortable for all users including pedestrians, bicyclists, transit riders, motorists and individuals of all ages and capabilities. These streets generally include sidewalks, bicycle lanes, transit stops, appropriate street widths and speeds, and are well-integrated with surrounding land uses. Complete Street design elements that emphasize safety, mobility and accessibility for multiple modes and may include crosswalks, bus lanes, landscaping, lighting, signaling systems and adequate separation between sidewalks and streets. Many jurisdictions have adopted Complete Streets policies to make accommodation of all users as an expected part of transportation projects. Charlotte recently won a national award for its attention to complete street policies. To implement these policies, jurisdictions are developing design guidelines and/or regulations. Incremental progress toward complete streets could be made by asking developers to add sidewalks and bike lanes to roads fronting property they wish to develop.